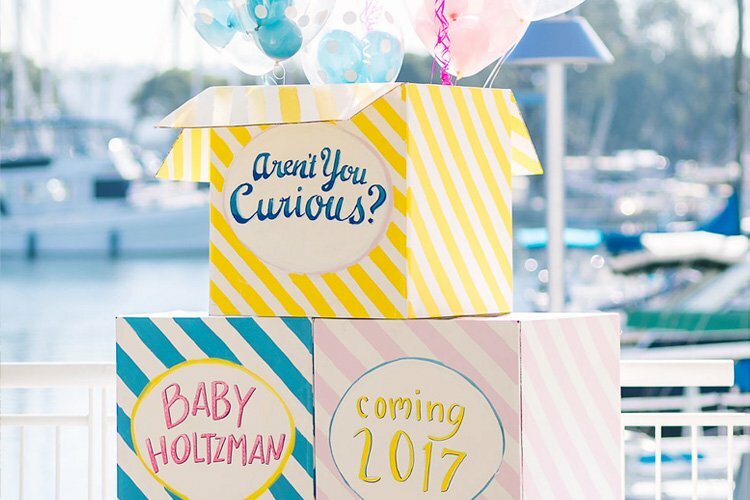 Maureen Anders of Anders Ruff here to share a Countdown Themed Party that I recently styled for a combined New Years and Birthday Celebration! 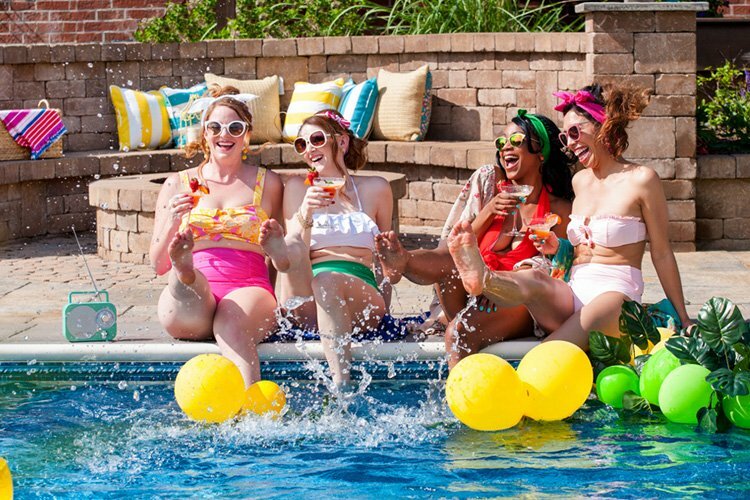 When you are counting down the days to an exciting life event, this theme lends itself perfectly to all sorts of occasions – from baby showers and milestone birthday parties to bridal showers & more! 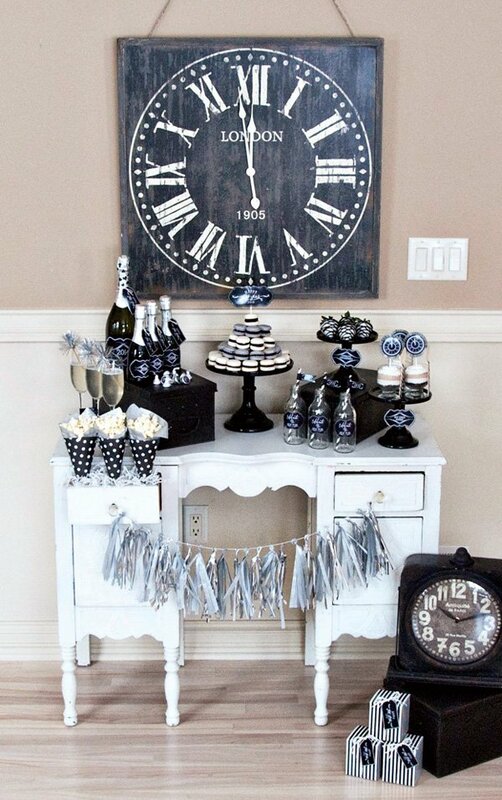 Clock decor mixed with monochromatic tones of grey, silver, black, white and cream throughout make look this both sophisticated and stylish. Quick and easy 5 minute layered Hot Cocoa “Mousse” with Oreo cookie crumble bottom. Dramatic monochromatic tassle bunting by alternating metallic and matte tissue tassles. Chalkboard style printable graphic decor featuring clocks and sophisticated script typography and signage. DIY Wooden spoons made “cute” with washi tape on the handles, as shown on the layered Mousse desserts. 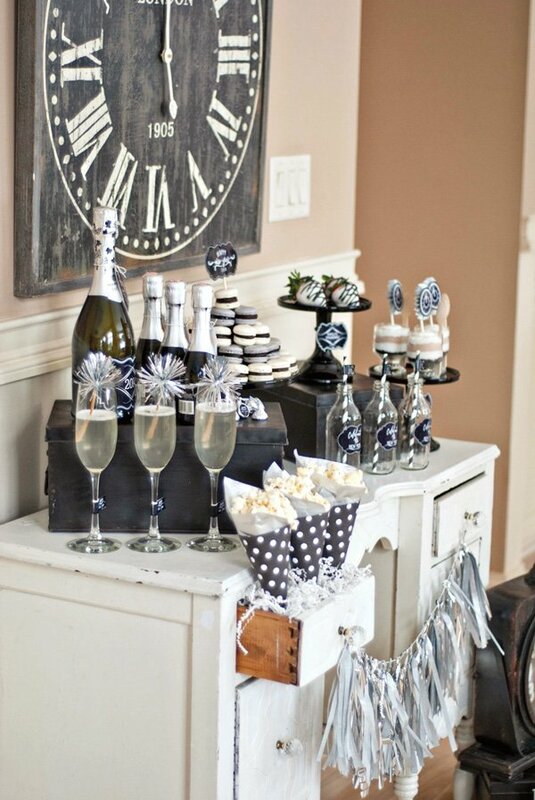 The clock was literally ticking as I put together a last minute Vintage Style Countdown Themed Party to celebrate New Year’s and the Birthday of a friend of mine. 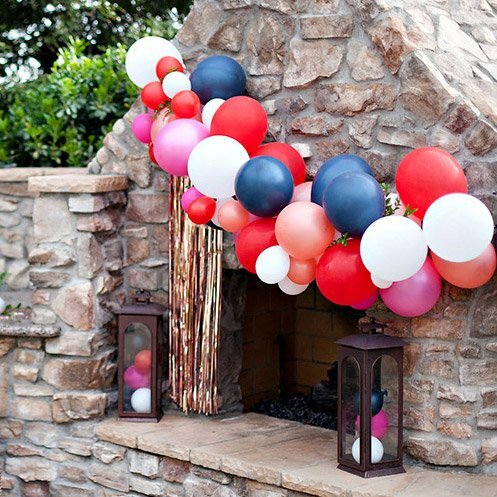 With 23 hours until the guests arrived, I knew I needed to create something simple, but striking, and quickly! I stuck to a monochromatic color scheme of tones of black, grey, silver, white and cream to bring sophistication and style to the table, while being versatile to celebrate both the New Year and a milestone birthday. By pulling pieces of decor from my own home, including a vintage antique desk and tin industrial style nesting boxes, I created a dessert table that was both functional and appealing to the eye. The front of the desk needed some decorating, so I created a monochromatic tissue tassel fringe by alternating metallic silver tissue tassels with matte silver tassels. This kept it from being too busy but added dimension and style. I designed the Countdown Printable Collection to include chalkboard style graphics mixed with a pretty script font and flourishes. 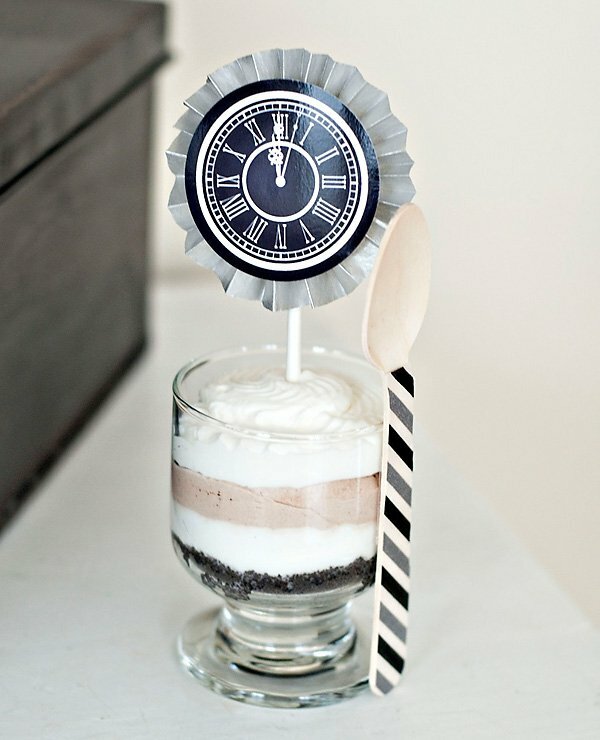 Labels, tags and flags were created and I carried the clock theme throughout the printable collection, which made the champagne bottles, glassware and treats look adorable. Using small glass cups, I created an eye-catching layered “mousse” in about 5 minutes. I filled the bottoms with ground up Oreos and then I layered homemade vanilla whipped cream and hot chocolate flavored whipped cream. For the hot chocolate flavored whipped cream layer, all I did was substitute half of the sugar for hot cocoa mix, which made it delicious and gave the dessert a pretty layered look. 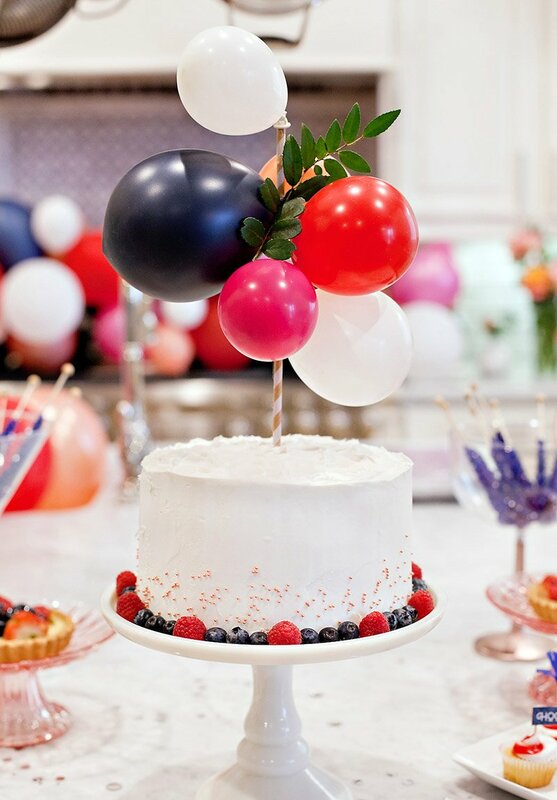 To incorporate the theme into the treats, I added a printable party logo from our printable collection on top of a fanned tissue paper ruffle. I then added wooden spoons to the sides of the mousse cups. I didn’t have any cute wooden utensils on hand, so I used plain wooden spoons and added black/grey striped washi tape to the handle to make it cute! Another easy and impressive treat were the chocolate covered strawberries. First, I dipped them in white chocolate. Once dried, I drizzled black melting chocolate over them. 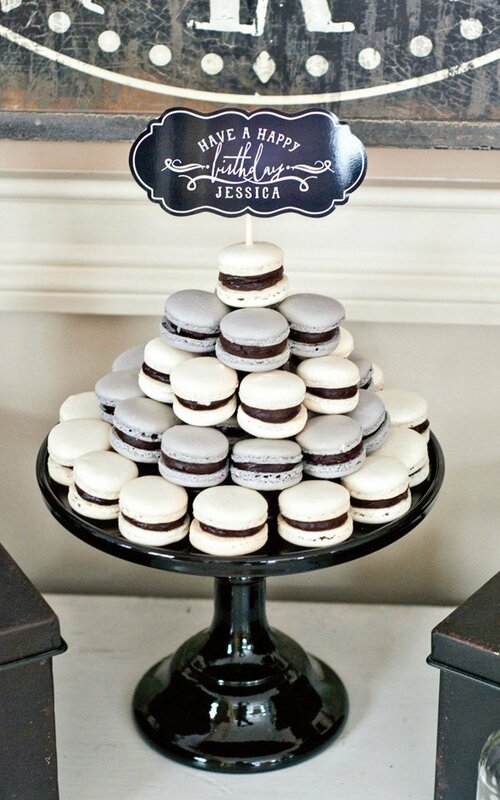 They were displayed on black milk glass cake stands that had a coordinating printable label on the base. 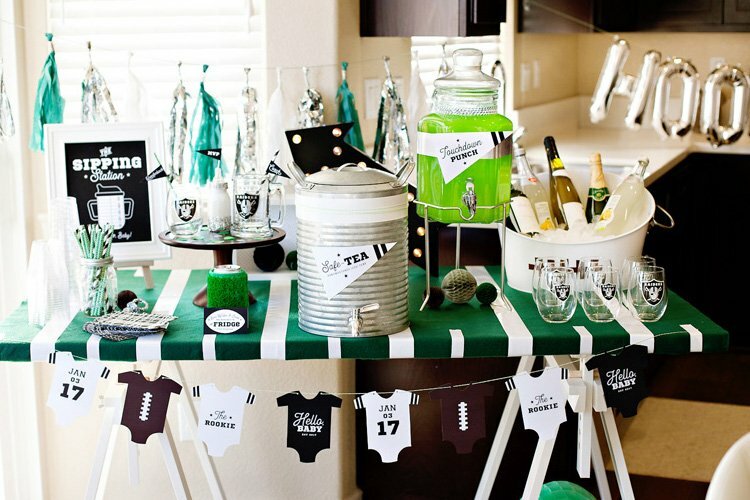 Champagne glasses were displayed with printable party flags around the stems and cute metallic fringe-topped swizzle sticks. 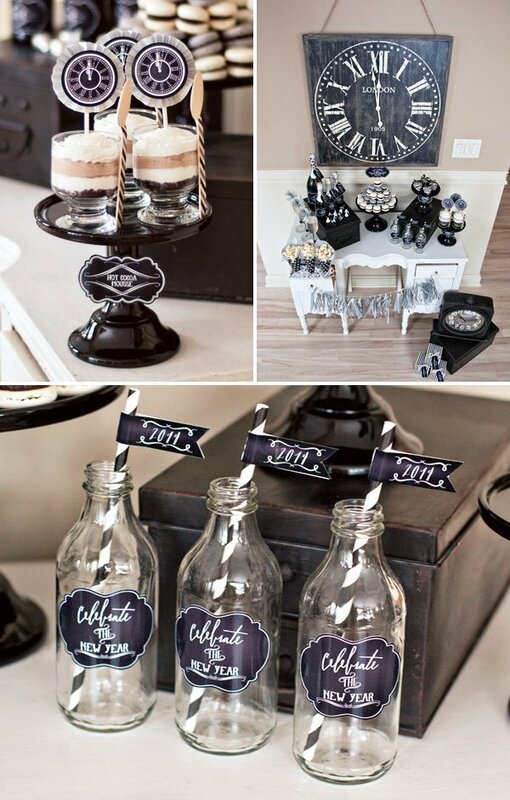 Glass bottles were ready for their beverages with cute printable labels on the front and paper straws with party flag embellishment. 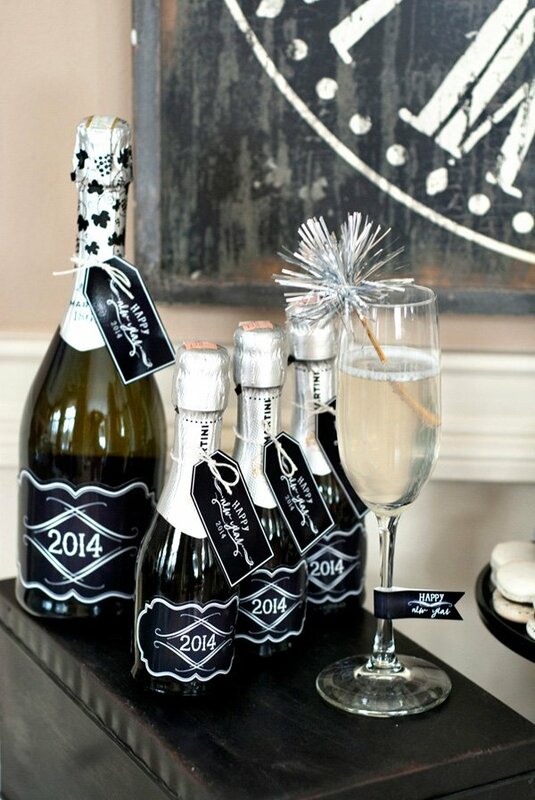 We displayed both large and mini bottles of champagne that were dressed for the occasion with a printable hangtag around the neck and a label on the front featuring the new year, 2014. 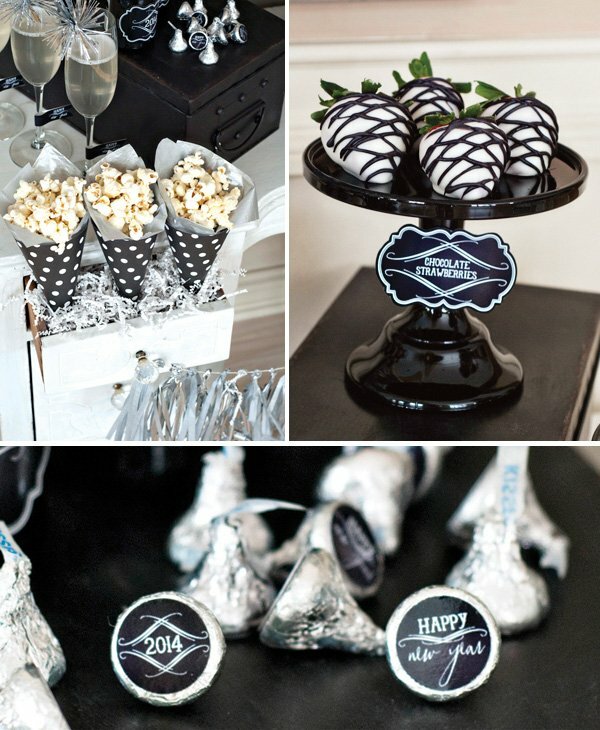 To tie in more silver into the table, Hershey Kisses were stacked near the champagne and embellished with printable party logos on the bottoms to help tie in the theme. 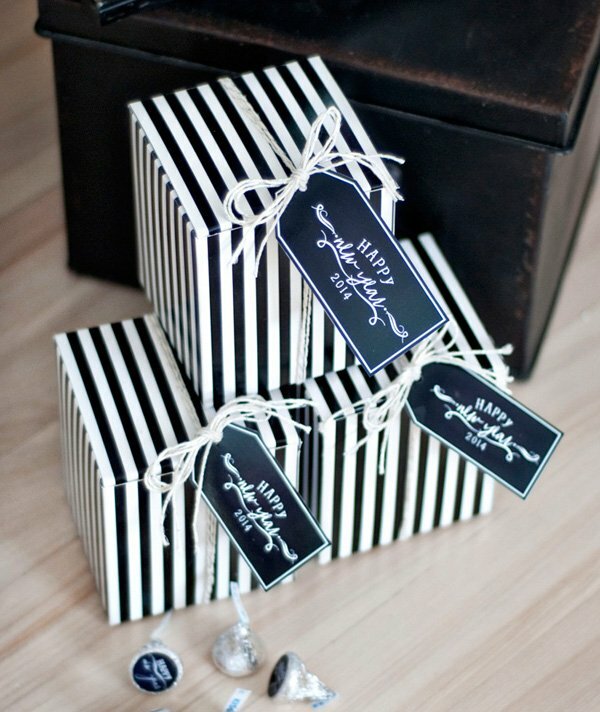 For simple and easy favors, I displayed cute black and white striped boxes from Nashville Wraps, which were filled with Hershey Kisses with printable logos. We tied a printable hangtag metallic twine to close the box. The guests loved the display and the theme was perfect! Such an elegant theme. Who knew black and white could be so fun.